“If your children aren’t following your rules, try posting them,” I suggested. “I did post the rules, but it hasn’t made any difference. My daughter Cellie still doesn’t follow them,” the mom complained. Rules only work when they are attuned not only to the needs of the family, but also to the age and capabilities of the child. Cellie, at three, is just starting to learn socially appropriate behavior. She probably started learning “please” and “thank you” when she was two, but that skill may not be solid yet, and “be polite” is too complicated and too abstract for the three-year-old brain. 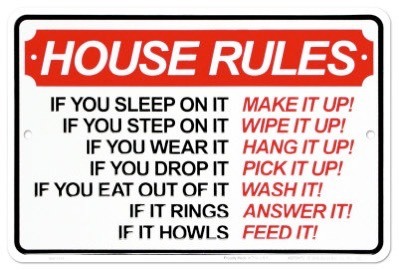 The other two rules are even more daunting—standards that many adults can’t meet all of the time! Clearly this mom has worthwhile goals for her little girl, but this mom needs help! · Rules are expectations and guidelines so avoid global words like always and never. and specific as possible so her achievements can be observed and affirmed. · Young brains are largely underdeveloped but growing fast, so keep the rules simple. · Young brains handle a few things better than a lot of things so limit the number of rules. As the child achieves some degree of behavioral mastery, add another rule. · Think about what each rule teaches. Look at the following rules for three-year-old Maya whose baby brother Jack is creeping. 3. Put crayons and markers away so baby can’t get them. 4. Brush teeth and wash face before bed. 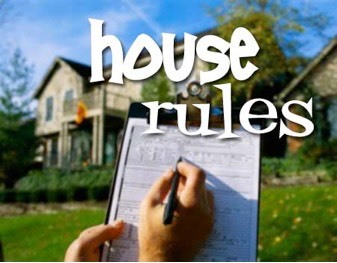 Although these rules are about very simple behaviors, each is like the tip of an iceberg. Each is a manifestation of a family value or an important life skill. 1. No hitting is about safety and personal boundaries. It also puts the child in a position of needing to learn conflict resolution skills. Of course a not hitting rule means parents can’t hit either. If they do hit, the teaching is that you can’t hit until you are big. 2. Say please and thank you. Three-, four-, and five-year-olds are busy with the identity questions: Who am I? Who are you? What do I do about that? How do I get along with others? Please and thank you are basic units of social manners, and a firm grasp of the importance of social manners, grounded in childhood, will help Maya in school, at work and in adult relationships. Of course, her parents are careful to model good manners toward Maya and others. 3. Put crayons and markers away so baby can’t get them is the tip of the safety, personal responsibility, and care of property iceberg. It also teaches about caring for others and helps Maya move out of her earlier position as the center of the universe. 4. Brush teeth and wash face before bed. These are early lessons about health, cleanliness, appearance, and responsibility for self-care. Very important life skills. Having good family rules is worth the effort. Lack of rules or not having to follow rules during childhood was identified by adults in the research studies as one of the aspects of overindulgence that causes difficulties in their adult lives.